When a deer is trapped on an icy river and a helicopter is dispatched to rescue it, you'd think it would pick up the deer and fly it to safety. No, it just blows it across the slick surface. 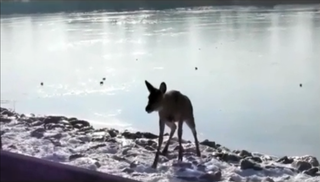 This pair of deer, which were apparently trapped on the frozen Mississippi for two days, got some assistance from a helicopter, but it can't land on the river or hoist the deer up. So it just uses the wind from its rotor to slide one of the deer to shore. The poor thing can barely stand when she gets out, but at least she's safe. If you watch the rest of the rescue here, you'll see the helicopter can't be bothered to help the other deer. While it hovers overhead, onlookers walk onto the river on water skis and then pull the animal back with a rope. Good thing someone was too lazy to clean that summer water sports equipment out of his truck.